Since I am having a hard time finding pictures online of items, animals, sports teams, musicians, etc., I decided to go out on this beautiful Sunday afternoon to take some pictures. I didn’t have a huge amount of luck, as I did not travel far. I get like that. I don’t really want to be around people sometimes (of course looking like I just stepped off a street corner may have had something to do with that). I did make myself walk into Starbucks and get a coffee. I went to the one in Yardley, PA by the lake next to a church. Both the Starbucks and the church are close to the road. 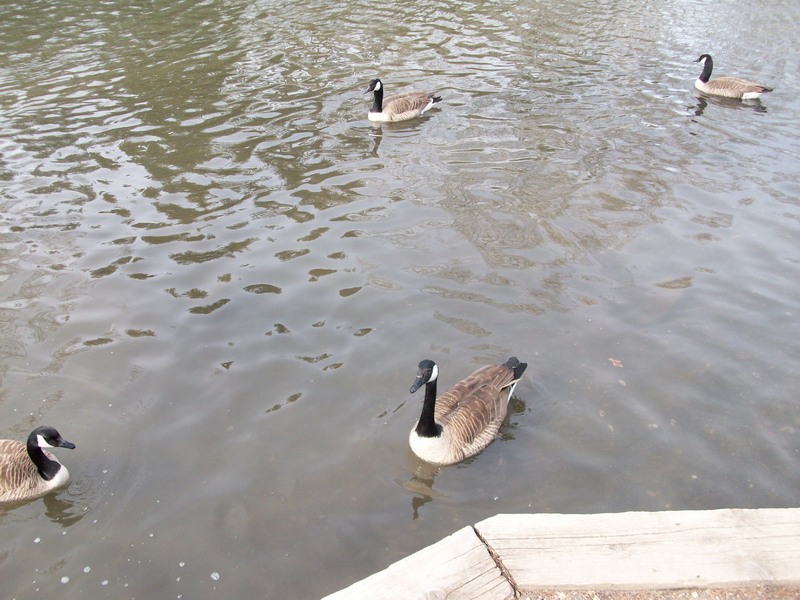 The lake is overrun with geese and ducks who have no problem approaching someone with a tasty treat. I ate most of the banana nut bread I purchased. I looked up to see a pair of eyeballs staring back at me. I was bitten by a goose when I was a wee lass. Now, I am nervous around geese. And I mean, really. They have those black hoods that hide their beady eyeballs. Never trust something or someone you can’t look directly in the eye. Needless to say, I ate about five morsels of my bread. The nerves really started to go crazy as the geese approached closer. There were ducks not too far behind. I threw a piece of bread into the lake. The geese careened on it like vultures on a carcass. I stood and watched, sure I was safe for a moment. The geese swallowed down the sopping bread. They hissed at each other. It was a battle of wills until the bread was gone. A motorcycle roared by, snapping me back to reality. Geese were staring me down, waiting for more. My left arm threw small pieces of bread as far as it could muster. I made a mental note to get back to the gym and high tailed it out of there.